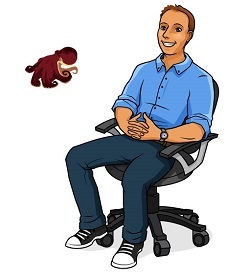 Ask A Biologist has become a great resource for students, parents, teachers, and life-long learners. Not all of our volunteers are scientists. How have we done this? By relying on the knowledge and devotion of our volunteers. 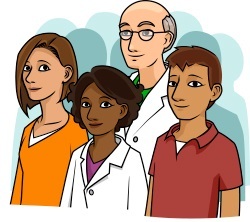 The majority of our volunteers are scientists, but we also have volunteer illustrators, translators, editors, and teachers. We couldn't think of a better way to thank our volunteers than to compare them to a fascinatingly intelligent creature: the veined octopus. The veined octopus (Amphioctopus marginatus) is also known as the coconut octopus. It is a small cephalopod, with a main body that is roughly three inches long. This little multi-legged brainiac can move on only two legs and has been seen carrying tools to hide or defend itself from predators. The talents of the veined octopus don't appear to develop all at once, but are formed over time. This is much like the volunteer efforts of our scientists at Ask A Biologist. Below, we've outlined the development of our volunteers alongside the life stages of this clever cephalopod, the veined octopus. Veined octopus eggs look like these giant octopus eggs. Image from Vimeo Challenges of Life video by Doug Anderson. 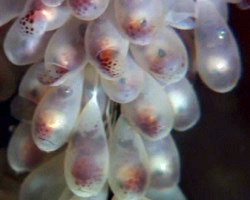 Veined octopus eggs are laid in chains called festoons. They can be found on coconut shells, broken bottles, or other objects on the sea floor. Under the quiet care of their mother, the eggs lay in wait for nearly 20 days before hatching. At Ask A Biologist, we have a lengthy list of action-ready volunteers. However, some haven't yet had the chance to hatch and swim in our volunteer waters. We still thank these volunteers for their willingness and readiness to help. 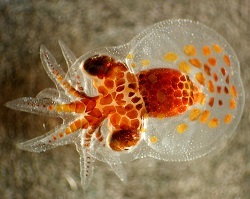 This unidentified larval octopus just recently hatched out of its egg. Image by NOAA. Hatchling veined octopuses are sometimes called paralarvae and they look like near-microscopic adults. Now and then, they are said to live a planktonic existence at the mercy of the currents, but they can swim forward and backward. Our larval volunteers are just starting out with Ask A Biologist and have answered questions from two or three students or made some other initial contribution to the site. These volunteers are extremely important, especially for the question and answer feature at Ask A Biologist. Veined octopus in shell. Image by Nick Hobgood. 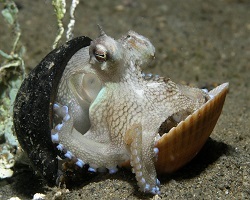 Juvenile veined octopuses start at about the size of an olive, so they can hide under all kinds of objects. They've been seen hiding in clam shells and even under bottle caps. Our juvenile volunteers are also very capable and creative. They contribute to Ask A Biologist in many ways. Some have been volunteers for years and have gone above and beyond to answer question after question we floated their way. Others have created rich, engaging activities or stories for the site, or they may have translated existing stories. Some may have even come to in-person outreach events to represent Ask A Biologist. All of them have had a huge impact on the success of Ask A Biologist. 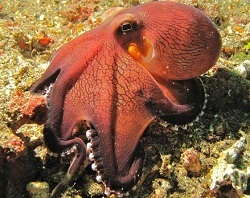 Many veined octopuses display dark, almost maroon, coloration. Image by Bernard Dupont. Veined octopus adults may seem small at only 6 inches long, arms and all. But these sage swimmers are the big thinkers of the cephalopod world. They walk on two legs while carrying objects, they use tools, and they even plan for the future. Some have been spotted carrying coconut shells to use as a shelter, keeping their own defensive structure in tow as they move. Our 'adult' volunteers at Ask A Biologist have devoted much of their time and effort to improving the site. They may have answered many questions, created many stories or other types of content, or edited lots of content. Though these volunteers are few in number, the site would be drastically different without their efforts. Didn't find your name in the acknowledgements but want to be included? Interested in volunteering? Additional images via Wikimedia Commons. Giant Pacific Octopus by Bachrach44. The Giant Pacific Octopus is thought to be the largest octopus, with one individual having an arm span of 32 feet.